If you are dipping your toes into the markets and are about to make your first investment, consider the safer products: bonds, blue chips, exchange traded funds (ETFs), and real estate investment trusts (Reits). 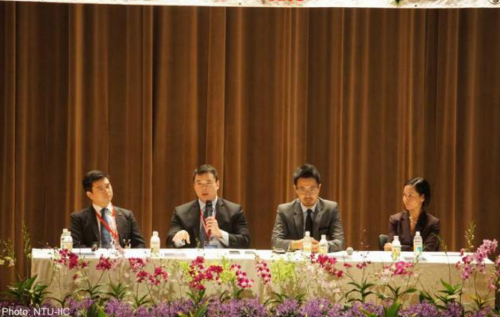 That was the advice to undergraduates from panellists at the Singapore Financial Conference, organised by the Nanyang Technological University's Investment Interactive Club on March 27. Bonds are a good starting point for new investors, said Lynn Gaspar, senior vice-president and head of retail investors at Singapore Exchange (SGX). Bonds are the first level of assets which are slightly riskier than holding cash but have coupons that offer some yield. Equities or stocks, which are riskier and bring higher returns, are also encouraged for at least part of one's portfolio if they are within one's risk appetite, Ms Gaspar said. "But that doesn't mean you should be playing around in a stock you know nothing about," she warned. Instead, look to companies that are stable and secure, which are the blue chip companies, she said. ETFs are another option. With a single purchase, investors can buy into a fund made up of the shares of the 30 largest companies in Singapore. ETFs are also a good place to start from if investors want to focus on the macro aspects of investing first, before delving into the micro side when they become confident, said Tan Tzu Ping, head of FICC corporate origination, Asia-Pacific global markets, Bank of America Merrill Lynch. Knowing macro aspects entails understanding the factors influencing economies such as interest rates and currencies. The strengthening US dollar, for instance, is taking a toll on earnings for US companies but benefiting European companies with a lot of diversified international earnings, Mr Tan said. Most young investors in Singapore are more interested in income, which means they want payouts from assets over time, rather than growth or asset accumulation, Ms Gaspar added. She recommends Reits for these income investors, taking into account interest-rate risk - "good" Reits in Singapore can give average payouts of 5 to 6 per cent a year, she said. To support the government's recent initiatives to expand the range of simple, low-cost products for individual investors, SGX is boosting its retail education efforts from this month, Ms Gaspar said. There will be new initiatives to make bonds, blue chips, ETFs and Reits more accessible to the average retail investor. However, Chang Tou Chen, managing director and head of banking for South-east Asia at HSBC, said that he would hold his horses if he were a student with limited funds. Before all else, he would top up his Central Provident Fund (CPF) Special Account (SA) to the maximum, as the SA pays a return of 4 per cent and is almost risk-free. After that, insurance would be his second stage of personal investment, before he accumulates physical assets such as a home. Building his portfolio would come last. While Ms Gaspar agreed with Mr Chang that maximising the CPF SA and insurance is a good first step, she encouraged investors to take a little more risk if and when they become more comfortable with other assets. The key to investing successfully boils down to asset allocation, according to Alfred Low, director and cluster head of Greater China at Credit Suisse. This refers to dividing one's money among different asset classes such as bonds, cash and stocks. The bulk of investment returns for a portfolio is generated by asset allocation, whereas only a small portion comes from what many investors focus on: timing, stock picking and gut feeling, he said. Larger risk appetites will lead one to commodities and equities, and in particular, shares of smaller companies, Mr Low said. Panel moderator Richard Dyason, general manager of the Securities Investors Association (Singapore), urged young investors to invest in knowledge before anything else. At the end of the conference, he gave a parting shot to the 400-odd students. "Spend on things that accumulate knowledge, because that's what's going to build your wealth in the future. Don't worry about how much money you'll make later, because whatever you're going to make five years after you work is a whole lot more than what you have now. For now, spend wisely and grow your experience."